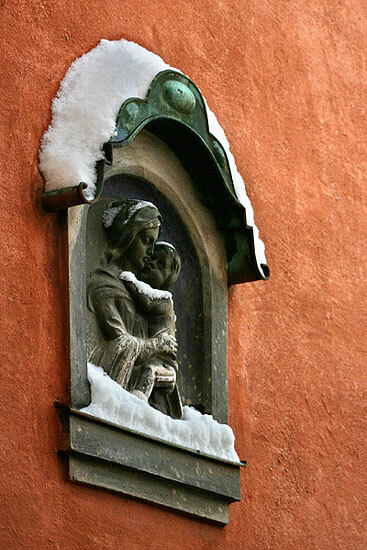 A madonna with a child depicted in a little shrine at a burgher house in Salzburg. International visitors of Salzburg might think that Salzburg is something like a Germanic Vatican, and there is actually some truth in it: The city was capital of a church-state where the Archbishop was at the same time the secular landlord for many centuries. This stopped only in 1806, when Salzburg was secularised. It became part of the Habsburg Empire at the Congress of Vienna in 1815. Today, religion still plays an important role in Salzburg, with the Roman Catholic church as an important cultural, spiritual and economic power. For further information, read our article on religion in Salzburg.